Weiswomen Creations: We have a winner! 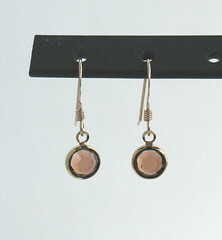 Congrats to Carolyn, who won the first ever Weiswomen Creations earrings. A lovely pair of Swarovski Channel Set Drop earrings will soon be hers! A random number generator from random.org was used to select the winning comment number. Carolyn chose the Smoked Topaz earrings you see here, but they will be created in a silver version. Thanks to everyone who entered and checked out all of our pretty earrings.